Delicate Arch at with background of La Sal Mountains in Arches National Park, Utah, USA is one of Utah's most famous icons. You see images of it everywhere - on magazine covers, computer screen savers and license plates. But photos do not adequately convey the stunning beauty that hits you as you come over the ridge and see the arch in person for the first time-when you stand under it, the arch towering above your head, slickrock canyons falling away below you, the snow-covered La Sal Mountains in the distance. It is a spectacular sight. This image belongs to the travel and nature stock photo library. This stock photo of Delicate Arch at Sunset with background of La Sal Mountains is available for licensing for commercial and editorial uses including websites, blogs, books, magazines, brochures and advertising. Restrictions may apply for images which contain third party copyrighted material or sensitive subjects. Photos of artwork are for editorial use only. 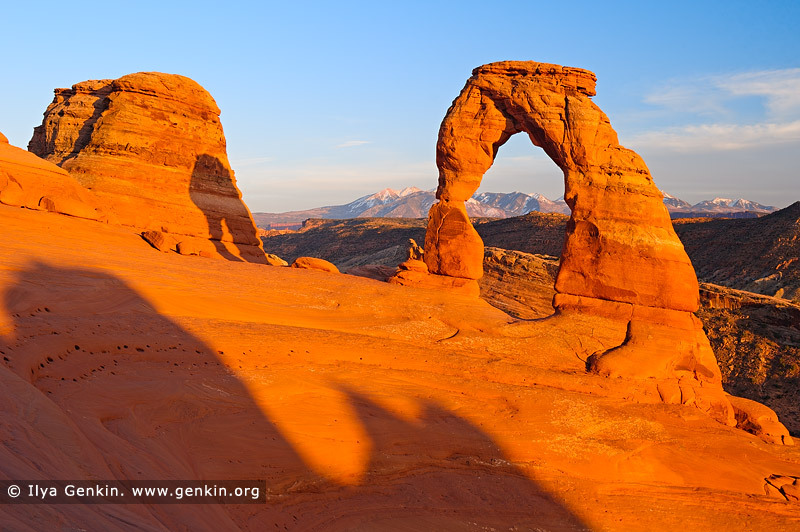 This image id AMERICAN-SOUTHWEST-0005 of Delicate Arch at Sunset with background of La Sal Mountains, is copyrighted © by Ilya Genkin. This is not a public domain image.